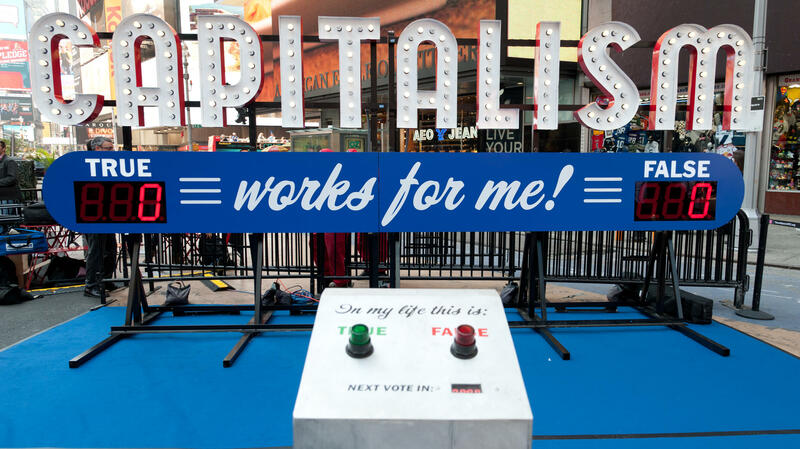 Steve Lambert's art installation asks people to vote in an effort to open up the discussion about capitalism. That word can be a red flag for many, Lambert says. 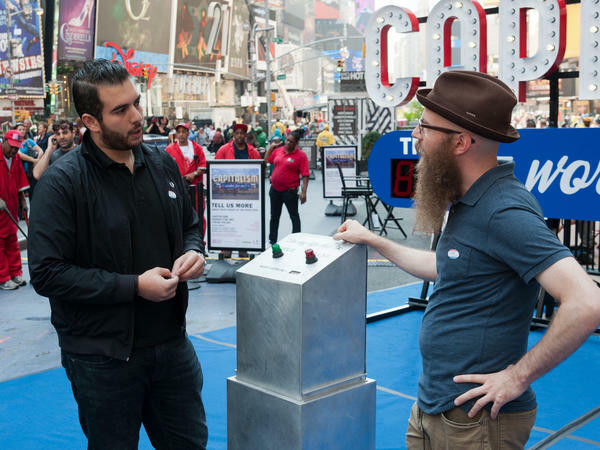 Artist Steve Lambert, right, asks people to vote on whether capitalism is working — for them. The art installation is in Times Square through Oct. 9. I'm walking through Times Square, the crossroads of the world. Just when I reach the line for cheap Broadway tickets, I see it: a giant billboard with the word "capitalism" in bright white lights and the words "works for me!" in cursive below. There's a podium and two buttons where you can vote whether the statement is "true" or "false." Peggy Demitrack, a tourist from Cleveland, is adamant when she pushes the "true" button. She says capitalism works for anyone who strives and educates themselves. When asked whether she has money for retirement, she adds: "Something! Yes. And you know what? Even if I didn't, if that all collapsed, I'd be down the street working for McDonalds. I would not be sitting home wanting to take something from somebody else." Steve Lambert, the artist who came up with this idea for "Capitalism Works for Me! (True/False)," has often done pieces about advertising and the media. He was once involved in a satirical hoax in which a fake "special edition" of The New York Times announced the end of the Iraq War in 2008, with more than a million copies printed. His new economics-themed art installation has been traveling around the country, and it's now in Times Square for a few days. "If someone came up to me and said, 'Can I talk to you about capitalism?' I'd feel like they were walking up to me and saying, 'Could I talk to you about Jesus Christ?' Um ... are you going to ask me to join some organization?" So how do you get people to reflect, and not argue? Lambert's first thought was to make it personal. It's not about whether capitalism works for the U.S., or for the government, or for the world, he says — "it is, capitalism works for me!" He says making an issue personal stops arguments — something, he jokingly says, that he learned from decades of therapy. Back in Times Square, many of the people I encounter are ambivalent, even embarrassed, to talk about capitalism. Eve Ting, who works in Times Square, says she drinks coffee at Starbucks and buys clothes at Uniqlo. She starts laughing and says, "I feel like this is a confession." Or take freelance designer Daniel Dunnam. "I work from home, I work my own schedule, I make lots of money, I have insurance," he says. "I have a very charmed existence, and I'm aware of that, so obviously the system is working, right? But then I started thinking about it, and I realized that I've got people in my family, or even just friends, who it's not working for them, and I decided that if it doesn't work for those I love and who I care about, then it doesn't work for me." Then there are those who can't make up their mind. Laura Wenus walks up to the podium and starts talking to Lambert. Capitalism has benefited her, she says, but "I don't know if I can live with the moral dilemma of having benefited while others have actually suffered from it." Lambert tells her it's up to her to decide. "Why is this such a tough decision?" she says. "No offense, but it's just a billboard, you know?" Lambert says his main purpose is to get people to slow down and ponder. He says people always ask him, "What alternative are you proposing?" He always says, "Something better." They ask what that means, and he says, "We don't know yet." It's at that point, he says, that the conversation begins to open up. It's almost like science fiction: Lambert wants people to go beyond the available answers and dream of something new and different. By the time I leave, "false" is winning slightly over "true," but it's pretty evenly divided. "Capitalism Works for Me! True or False" is in Times Square through Oct. 9. Lambert got support from Times Square Arts and The French Institute Alliance Française. Steve Lambert is an artist who has often done pieces about advertising and the media. He was also once involved in a satiric hoax, the New York Times special edition, which printed more than 1 million copies in 2008 imagining the end of the Iraq war. Now he has a new art installation called "Capitalism Works For Me! True or False?" It's been traveling around the country. It will be in Times Square starting tomorrow. NPR's Margot Adler reports. PEGGY DEMITRACK: Something, yes. And you know what? Even if I didn't, if that all collapsed, I'd be down the street working at McDonalds. I would not be sitting home wanting to take something from somebody else. ADLER: Steve Lambert, who came up with this idea, says talking about capitalism is almost impossible without sounding tedious. Except when he talks about it, he's pretty funny. Here he is at the Creative Time Summit last year in New York. STEVE LAMBERT: If someone came up to me and said can I talk to you about capitalism, I'd feel like they were walking up to me and saying, can I talk to you about Jesus Christ. Are you going to ask me to join some sort of organization? I know some of you may be thinking, Steve, I don't know what you're talking about. We talked about capitalism all the time in my Occupy encampment. Congratulations. You are not my audience. ADLER: Back in Times Square, most of the people I encounter are ambivalent, even embarrassed to talk about it. Like Eve Ting, who works in Times Square. EVE TING: I also drink a lot of Starbucks, I shop at H&M and Uniqlo and - so I feel like this is a confession. ADLER: Or take freelance designer Daniel Dunnam. DANIEL DUNNAM: I work from home, I work my own schedule, I make lots of money, I have insurance. I have a very charmed existence and I'm aware of that, so obviously the system's working, right? But then I start thinking about it and I realize that I've got people in my family who, or even just friends, who it's not working for them, and I decided that if it doesn't work for people I love and who I care about, then that doesn't work for me. ADLER: There were those who can't even decide. Laura Wenus walks up to the podium and starts talking to Lambert. Capitalism has benefited me, she says. LAURA WENUS: I don't know if I can live with the moral dilemma of having benefited while others have actually suffered from it. LAMBERT: It's up to you. You're the one who decides. WENUS: Oh, why is this such a tough decision? No offense, but like it's just a billboard, you know. ADLER: Lambert says his main purpose is to get people to slow down and ponder. People always ask him, what alternative are you proposing? LAMBERT: I'd always say something better, and they would say, well, you know, what's that mean? And I would say we don't know yet. And then things would sort of start to open up. ADLER: Almost like a science fiction novel, Lambert wants people to go beyond the available answers and dream of something new and different. By the time I leave, false is winning, but it's pretty evenly divided. "Capitalism Works For Me! True Or False" is in Times Square from October 6th to October 9th. Margot Adler, NPR News, New York.